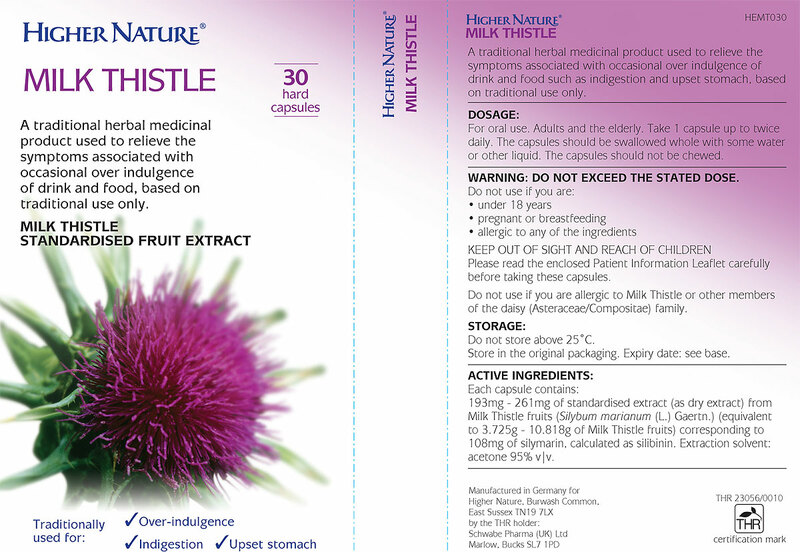 Milk Thistle is a traditional herbal medicinal product used to relieve the symptoms associated with occasional over-indulgence of drink and food, exclusively based upon long-standing use as a traditional remedy. Beat the hangover - today's busy and changing lifestyles often result in the increased intake of alcohol and food. 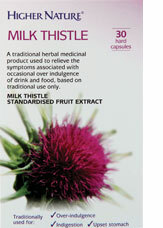 Milk Thistle is a well-known herb traditionally used to relieve the symptoms commonly associated with 'the morning after.' The ancient Milk Thistle plant is a member of the daisy family and has traditional use as a herbal remedy for digestive health. The cooked roots, leaves, shoots and stems were also once a popular part of people's diets. It's botanical name, Silybum, comes originally from the Greek word sillybon, which probably refers to its tufty purple-red flowers.One capsule contains 193mg - 261mg of Milk Thistle (Silybum marianum (L.) standardised fruit extract, which is equivalent to 3.725g - 10.818g of Milk Thistle fruits. This amount of standardised extract corresponds to 108mg of silymarin, calculated as silibinin (silybin). Silibinin (silybin) is the main active part of silymarin, which is the collective term for the flavolignans that are present in ripe Milk Thistle fruits. Not suitable if under 18 years, pregnant, or breastfeeding. Consult your doctor if you have active liver disease. 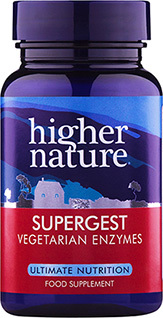 193mg–261mg of Milk Thistle standardised fruit extract [corresponding to 108mg of silymarin, calculated as silibinin (silybin)]. Take 1 capsule up to twice daily (adults and elderly). Not suitable if under 18 years, pregnant, or breastfeeding. Consult your doctor if you have active liver disease. Not available in Ireland. If you love your liver, give it some milk thistle. I do. 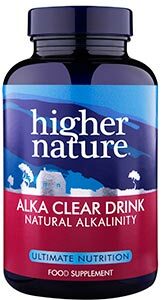 It helps enormously with the daily detox process, especially as you get older. 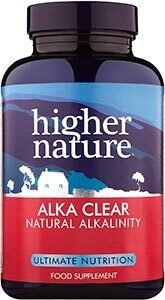 It gives me peace of mind to know that my liver has maximum support to function on an optimal level.